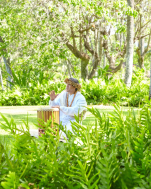 At Ko Olina, we are committed to the land, the sea and our rich history of cultural traditions. We embrace the philosophy of “living pono,” living in harmony with nature and preserving what we love. Ko Olina is in Wai’anae, a lush, green oceanfront retreat on the calm leeward coast of Oahu, Hawaii. Guests travel from around the world to be immersed within the abundant diversity of Hawaii’s ecosystems, the ocean, the earth, the winds, our heritage. Born of fire and blessed by the gods, our islands have become famous for their beauty, hospitality and traditions. Ko Olina continues to set new standards for luxury vacation resorts with its mix of like-minded resort partners that include Aulani, a Disney Resort & Spa; Four Seasons Resort Oahu at Ko Olina; Marriott’s Ko Olina Beach Club; and the Beach Villas at Ko Olina. It is also home to the award-winning Ko Olina Golf Club and the Ko Olina Marina, Hawaii’s only private deep-draft marina. We aspire to be a role model for sustainable resort communities around the world. While it is a privilege to share Hawaii’s natural gifts, the ocean, ‘aina (land) and sky, we are mindful of our responsibility to care for the environment we celebrate every day. Aloha. We invite you to find your own Place of Joy at Ko Olina.